Please if you are on Twitter press the press the tweet button below. If you re-write and tweet individual story headlines (tweeted) with links, please make sure you use #F1. Button does not feel the need to retire either as he is still enjoying racing and believes his future is at McLaren. “It is a very good partnership, we have worked very well over the past four years and there is definitely more to come.” He goes on saying he feels like a big part of the team and they work well together. So why is McLaren stalling? Could it be that McLaren is seriously considering Massa to replace one of their drivers? Is it Button that really has to worry about his seat for next year or could Perez also face the axe? During today’s McLaren phone in Jonathan Neale, McLaren’s managing director, said they are close to making an announcement. With the options on both Perez and Button expired are they trying to push negotiations their way or looking to sign someone completely different. If I were Button/Perez I’d be really worried. Read between the lines and this is a veiled threat that if you don’t toe the line we will change our line up and don’t think we are worried about 2014 and the regulation changes. Things are getting interesting at McLaren. Kleine Zeitung reports that Walter Kafitz has left his role at the the Red Bull-Ring. Kaft was the former chief at the Nurburgring during the time where the financial’s headed over a cliff. He joined the Red Bull Ring organisation early last year hand has been key to it’s redevelopment and bringing the F1 circus back to Austria in 2014. He left yesterday, “with immediate effect” and this has been confirmed by the organisation for whom he worked. The RBR have given no indication as to who or when a successor will be appointed and Kafitz himself has made no comment. Paul Gutjahr started racing in the late 1960s with Alfa Romeo, Lancia, Lotus and Porsche, then March in Formula 3. In the early ‘70s he became President of the Automobile Club Berne and organised numerous events. He acted as President of the organising committee of the Swiss GP at Dijon between 1980-82. Between 1980-2005 he acted as President of the Commission Sportive Nationale de l’Automobile Club de Suisse and in 2005 he became President and board member of the Auto Sport Suisse motor sports club. Gutjahr is President of the Alliance of European Hill Climb Organisers and has been steward at various high-level international competitions. He was the Formula 3000 Sporting Commissioner and has been a Formula One steward since 1995. Italian-born Vincenzo Spano grew up in Venezuela, where he went on to study at the Universidad Central de Venezuela, becoming an attorney-at-law. Spano has wide-ranging experience in motorsport, from national to international level. He has worked for the Touring y Automóvil Club de Venezuela since 1991, and served as President of the Sporting Commission since 2001. He was president for two terms and now sits as a member of the Board of the Nacam-FIA zone. Since 1995 Spano has been a licenced steward and obtained his FIA steward super licence in 2003. Spano has been involved with the FIA and FIA Institute in various roles since 2001: a member of the World Motor Sport Council, the FIA Committee, and the executive committee of the FIA Institute. Derek Warwick raced in 146 grands prix from 1981 to 1993, appearing for Toleman, Renault, Brabham, Arrows and Lotus. He scored 71 points and achieved four podium finishes, with two fastest laps. He was World Sportscar Champion in 1992, driving for Peugeot. He also won Le Mans in the same year. He raced Jaguar sports cars in 1986 and 1991 and competed in the British Touring Car Championship between 1995 and 1998, as well as a further appearance at the Le Mans in 1996, driving for the Courage Competition team. Warwick is a frequent FIA driver steward and is President of the British Racing Drivers’ Club. Ferrari is expected to shift all it’s focus and resources to the 2014 project even though Alonso is second in the championship trailing Vettel by 53 points. This is probably not what Alonso wants to hear. Another year and another championship not quite there. Let us hope for Domenicali’s sake it is not a hand around the shoulder on the way to the front door. In all honesty, replacing Button by Massa does not make sense in so many ways. Button is faster, he’s a world champion, he’s got loads of British fans while driving for a British team, he seems further from his retirement than Massa (despite the slight age difference), etc. I can only think of one reason why Macca would even consider it. Money – exploiting the Brazilian (sponsorship) market. But that actually doesn’t make that much sense either for a team of their stature. The question remains then why they haven’t taken up the option yet. Are Button’s requests for changing the terms of the contract getting on their nerves? In that case, “talking” to Massa is only a way of increasing the pressure during the negotiations. So no, I don’t think we should be taking this too seriously :). But is Button faster? More consistent probably yes but we also have a question, why did Brawn/Merc not extend his contract after 2009? And aside from this year, it sure looks as though he made the right move. As Marcus points out, Brawn/Merc did extend his contract. Button himself elected to move. And yes, I do really think he’s faster than Massa, whose only shot at the title was because the team pushed him in favour of his team mate. I realise something similar (albeit technical) can be said about Button’s WDC, but he redeemed himself going up against Hamilton. I wouldn’t see Massa pull that off. Given that McLaren were willing to ditch Hamilton, if I were Button I would be worried. Likely they are trying to give him the same haircut they wanted to give Hamilton given his lack of sponsorship. Hamilton walked, guess we’ll see what Button does. Is Slim a nationalist or a businessman? Is a Mexican driver really important to his company? I’d love to see Button / Huelkenberg at McLaren and Maldonado / Grosjean at Lotus (think of all the jokes! the jokes!) 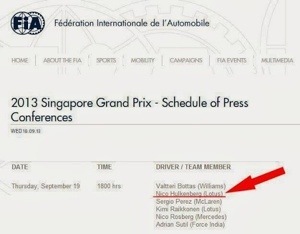 and Massa / Bottas at Williams – if rumours about Felipe are true. And somewhere Frijns should also fit in. But that’s me being a nationalist. brawn/merc wanted to extend his contract but button jumped ship. i could see mclaren hiring massa, considering that he showed that he is loyal and a team player, but i can’t see them signing him to replace button. true, both mclaren drivers have disappointed this season, as they haven’t managed to do what hamilton used to do for them, drag a bad car where it doesn’t belong. but there are only two drivers currently available who showed that they are able to do that: hulkenberg, and to a lesser extend sutil. so if i was mclaren and were to replace my no.1 driver, i would sign the fastest guy that is currently available and that is hulkenberg. massa on the other hand is a driver similar to the ones they already have, he is fast when the car is right and disappears into nowhere when it isn’t. Maybe McLaren are using the dangling contract renewal to give Jenson a carrot to keep pushing thru the midseason? To many Ferrari drivers to choose from? IF I were McLaren, I would only consider Alonso to the extent it caused problems for Ferrari, after all, it didn’t all work out so great last time for the two of them. On the other hand, lots of Hulkenberg to Ferrari talk, cheaper than Button, possibly as fast, and it would screw Ferrari’s plans for 2015 in all likelihood. Grosjean is staying at Lotus, but I would think Button might also be a good match for them as well. AS far as Massa, I’m sure he knows rather a lot about Ferrari’s program at this point so it might also be worth their while, particularly if Perez’ sponsor doesn’t want to play ball. Wouldn’t we both like to know!! I have never heard of the first two stewards, but the description of them leads me to think that 2/3 of the stewards are political. Should a person who started racing in the 1960’s really be a steward? Is this an example of FIA old mens rule? Reading the recent statements of LdM and SD, it certainly looks like now both are fed up with FA and his antics. It must have been hard on SD, when LdM stepped on his face for years, and backed up a driver instead of the team principal. SD:s relationship with Kimi never vent sour, and to my understanding Kimi’s reference to one person that he didn’t get along with was not LdM but Schumi, who schemed with the development of the car. Now after a number of years with Alonso, and with the input of both SD and James Allison LdM in practical terms admits a mistake, which he off course in a latin honour culture cannot admit in public. Apologising to Kimi in a private and confidential contract can be done, since it behind a confidentiality clause. All in all, Alonso is on his way out, and is publicly made to feel it. I saw LdM said Kimi can win the title next year… quick, give Alonso a hug, he is feeling lonely! Good to hear from you Sponsor. It is true that Perez brings a lot of money with him however it should accompany some performance clause as well should it not? What is clear is that Button takes a salary while Perez can unlock the South American market for McLaren and sponsors and one could imagine this is a market that GSK would be interested in. You mentioned Telmex and McLaren. Will this be a deal between Telmex and them or KPN should the deal with America Movil be a success?